If you’ve been a cocktail enthusiast for more than a few years, then you have most likely experienced the ebbs and flows of cocktail culture. Currently, we are in a time in cocktail culture where guests expect expertly crafted cocktails in a casual - albeit inviting - environment, with efficient service, and in good company - of course. No longer are the days with inefficient 12 ingredient cocktails that put you to sleep while waiting in between drink orders. Now, most cocktail bars have not only depleted the number of ingredients needed to complete their recipes, but they’ve also taken to using advanced culinary methods to create new, and interesting ingredients that all happen behind-the-scenes. These efficiencies and innovations make bartenders’ jobs seamless during service, while improving the guest’s experience at the same time - all while maintaining the integrity of the end product. Mister Paradise have done the former in a way that, arguably, not many bars have. 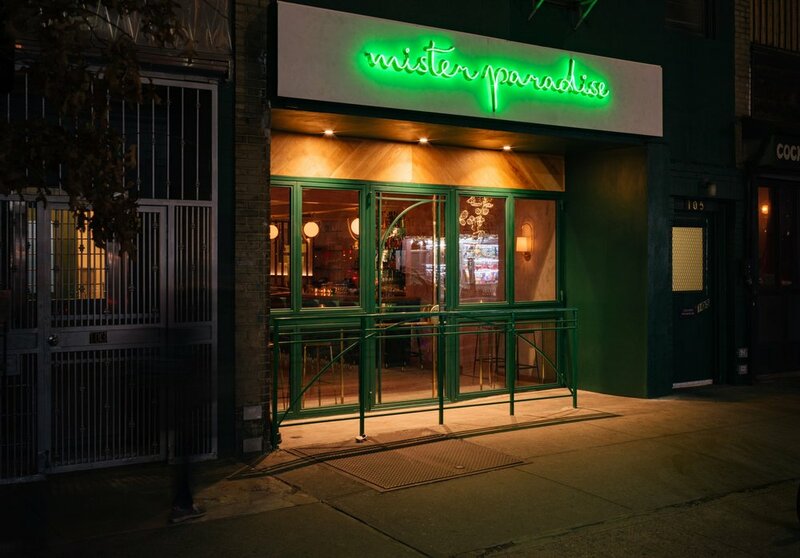 Fresh on the scene, the recently launched East Village cocktail bar, Mister Paradise, has not taken long to achieve a level of excellence that most bars can only dream of. While they may be sorting out the kinks that come with any new bar opening, the space, food, and cocktails all showcase a level of thoughtful storytelling and quality that is difficult to recognize as anything less than brilliant. Owner, Will Wyatt (previously of NoMad Bar), along with Chef/Partner Jeremy Spector and the team behind the East Village’s Drexler’s and Boulton & Watt now offer New Yorkers a special bar experience in the form of elevated hot pockets (yes, like your old childhood snack) and innovative cocktails, including a nerdy martini and old-fashioned. By working with high-end ingredients and specific techniques to prepare many of their creative libations behind the scenes, they manage to give their guests the quality you’d find at world renowned cocktail bars but in a more casual, tongue-in-cheek environment that many drinkers are now seeking out. They are incorporating advanced culinary ingredients and methods into their pre-service prep, such as clarifying full cocktails, diluting with teas, and making entire drinks sous vide. Mister Paradise prepares, and expertly balances cocktails before the night even starts - encouraging guests to taste from a menu of unique, relatively unfamiliar twists on familiar classics. Take for example, their reimagination of the Dirty Martini, the Doctor Angel-Face. This cocktail uses Japanese barley shochu instead of vodka or gin, along with verjus, sherry and a clarified tomato water dashi that brings the same acidity and salinity responsible for the classic’s appeal but is instead crafted with expert ingredient pairings that elevate this cocktail into what may be the best Dirty Martini you’ll ever have - yes, seriously. To satisfy the Old-Fashioned drinker, their riff on the classic which they’ve named the ‘Cafe Disco’ combines rye whiskey, olive oil, buckwheat, coffee and absinthe, all of which are cooked in a sealed bag pre-service, then kept chilled in the freezer, ready to pour upon request. Owner Will Wyatt details the inspiration behind this one as his mother’s buckwheat pancakes that she would make him as a child - showcasing the authenticity and thought that has gone into each cocktail. If you’re planning to visit with a few friends, they offer large-format cocktails which will satisfy 2-6 people, and specialty shot-style drinks will also star on this light-hearted menu. Gourmet revivals of shooter mainstays from the 80’s and 90’s will surprise and delight guests while not substituting quality for fun. 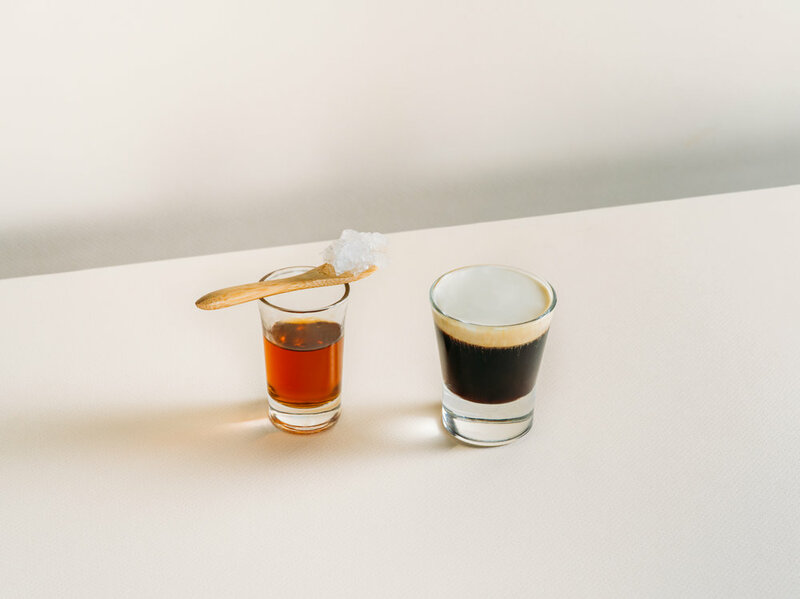 The Paradise Pickle-back chases Cynar and whiskey with a pickling brine mignotte that’s been clarified and frozen into a granita, while the Crossfit Breakfast, a twist on the creamy BJ shot, combines aged rum, coconut, and coffee with a malted pandan whipped cream. Mister Paradise’s decor is as playful as the flavors you’ll find on the menu. Their emerald green neon sign on the storefront welcomes guests into the space, and continues inside where it’s paired with a clean chic white in the form of the bar, seating, and other creatively designed details. It’s as if you walked into a trendy, retro cocktail lounge in the Wizard of Oz’s Emerald City - except with a Lower East Side vibe. If you’re looking for the main take away, it’s that Mister Paradise is the place to go for excellent cocktails, nostalgic bar bites, in a beautifully designed space that will guarantee you a good time. “We really just want it to be a party, all the time” says Wyatt. “Guests should be able to cut loose anyway they want to - hopefully not break anything - but still have a great time.” At the end of the day, that’s what it’s all about, right?